Josh Coates, founder of Mozy and current CEO of Instructure, once taught a series of classes at BYU on high-tech startups. I jumped at the chance to audit his class. One of the things Josh covered was what should happen during the first 100 days (14 weeks) of a high-tech startup. He recommended interviewing one potential employee every day. Pitching to the least important investor first lets you have a chance to practice in a situation where making a mistake isn’t as damaging. I first met Josh just after publication of an article he wrote on how many angel investors in Utah were doing it wrong. The article, entitled “Poison in the Well”, in addition to having a great title, was direct and clear in its criticism. It was one of the reasons I later applied to work at Mozy. For anyone who knows him, I think “direct and clear criticism” is a good phrase to describe what it’s like to work for Josh. His class was no exception. It was a great chance to learn from someone who’s been there and done it successfully. Of course, it can’t really be both new and improved. Logically, it has to be one or the other. It’s just that I’m excited about the 1.6 release of Mozy’s Mac client. It was finished last week and the response has been very positive. Our last few releases, while making improvements in many areas, seemed to have lingering and subtle problems. With the 1.6 version, we hope to have finally put them behind us. We turned on auto-update today. If Mozy hasn’t updated itself yet, please feel free to grab the latest version of MozyHome (or MozyPro) and let us know what you think. You can see the official list at the pages linked above. Mozy only makes the list of changes available for the current release, so I’ve copied them here for the future. You can see the changes in Mozy for Mac 1.4 and Mozy for Mac 1.5 too. If you have chosen one of those languages in System Preferences, Mozy will use it automatically. No assembly required. If you find spots where the translation doesn’t make sense, please let us know. The other major change — the one I’m most excited about — is the new file scanning engine. This is how Mozy finds all your files and decides which ones to back up. In the past, we’ve depended on Spotlight, Apple’s file scanning feature in OS X, for about half of our scanning. Backup Sets that searched for files of a certain type used Spotlight. Backup Sets that matched a folder (and selections made in the Files & Folders tab) scanned the hard drive directly. We kept finding that Spotlight returned inconsistent results in some cases. So we decided to stop using it. While we were making the change, we simplified how things work and made everything but the initial scan much, much faster. Mozy now uses far less memory, even when backing up millions of files. There are still some improvements we want to make, but the new file scanning engine makes Mozy feel rock solid. If you’re new to Mozy, you can try our 2GB-for-free, no-strings-attached version here. My friend and former co-worker Matt Ryan recently commented on the impending death of Novell Forge. A message on the Novell Forge site confirms that Novell will be shutting things down soon. I can corroborate some of Matt’s story as I was on the Forge team for about a year during its heyday. But what really interests me about the situation are the implied instructions on how to neglect a successful product into a slow death that can be blamed on the product itself. Avoid rewarding or recognizing any of the people involved. Even better, reward someone else. Do not feed its success. Withhold funding, staffing and career growth opportunities. Provide poor support. Delay fixing problems. Set unrealistic goals and expectations. Blame the product or team for failure. Find excuses to kill the project. Focus on the negative in all meetings with executives. This was a particular worry at Mozy when it was acquired by EMC. They promised that EMC did not want to be the lumbering elephant that accidentally squashed its shiny new purchase. And it was true. But we worried about accidental squashing anyway. It has been two years, and I have seen projects and executives come and go. Though I do not believe it was intentional, at times it felt like Mozy was being neglected. But the core of Mozy has remained strong and continues to grow. Execute anyway. Deliver a quality product in the face of neglect. There is precious little a neglected production team can do other than produce. I heard something once I have always remembered: nothing succeeds like success. It is much harder to produce in the face of neglect, but it is also nearly impossible to ignore or argue with. Mozy is clearly not perfect, but despite occasional neglect it continues to provides a valuable, profitable service. Working with smart people helps. Working for smart people helps. Working with people you like helps. Working on something you care about helps. Working with cool technology helps. But over time, delivering a useful, profitable product is what matters. After a two week beta period, the 1.5 release of Mozy for Mac was released today. We’ve made a lot of improvements over the last few releases. If you’re new to Mozy, you should try our 2GB-for-free, no-strings-attached version here. Consumer and business versions of the software can now run simultaneously on the same machine. Added a file scanning progress indicator in the Configuration window. Added a warning that appears when a backup is started before the product is fully configured. Added a warning to prevent changes being lost when the Configuration is closed without saving. Simplified the list of options in the menu bar. Improved memory usage during backup and restore. Improved the way network encryption keys are retrieved. Improved the ability to restore default backup sets in the Configuration window. Improved the efficiency of the log file collector. Improved the handling of temporary files. Improved the handling of database corruption. Eliminated unnecessary API calls to improve performance. Fixed an issue that prevented some Mac 10.4 (Tiger) users from backing up properly. Fixed many instances of potential configuration corruption. Fixed an issue importing a personal key into the decryption utility. Fixed a potential root exploit security issue. Fixed an issue that prevented some files with aliases in their paths from being backed up. Fixed an issue where Status would get stuck if the backup process was not running. Fixed an issue that caused Restore to crash for some users. Fixed a rare issue when restoring files with resource forks. Fixed an issue where the uninstaller missed some files. Fixed an issue with handling email addresses containing a “+” sign. Fixed a display defect in the Files and Folders tab. Fixed a display defect with the “Temporary Files Location” in the Preferences window. Fixed the display of exclusion notifications. Fixed a display defect which appeared after saving changes in the Configuration window. Fixed a rare issue which forced user credentials to be reentered. I live along the Wasatch Front which is surrounded by beautiful mountains. Not quite as pretty as the Tetons in Wyoming perhaps, but I’ve always wanted to climb the nearby Mount Timanogos. Of course, I thought I’d start with one of the smaller mountains closer to Spanish Fork and work up to the 12.4 mile round trip hike up Timpanogos. But when my employer Mozy sponsored a company hike, I decided I’d jump on the bandwagon. About 20 people took the hike that day, including two who got to the top (the vertical elevation gain is almost a mile at 4,652 feet) in less than two hours. I started out keeping up with those guys. I’m sure that the embarrassment of having a newcomer like myself tagging along is what caused them to pull ahead after about 10 minutes. Yeah, that was it. We hit the trail at 6:17am. In my rush to keep up at first, I didn’t notice much of the scenery. But it’s a gorgeous hike. This is the view of the top (on the right) from the second meadow area. Well, I thought it was the top. It turns out that you can’t actually see the peak from here. It’s a higher point behind the peak on the right. There’s nothing quite like thinking you’re at the top only to to realize you aren’t. From the meadow, you go up this trail to the saddle where you can see Utah Valley for the first time. This is what the trail up to the saddle looks like from the peak. The saddle is just above and to the left of center. The climb from the saddle to the peak was, by far, the most exhilarating part of the hike. Slower going and entirely rock, but with victory close at hand. Reaching the top was awesome. I got there in 3 hours 23 minutes. Five of us summitted fairly close together. Mark (back left) took much better pictures with the nice camera he lugged the whole way up. After getting down, I found out that Mount Nebo is actually the tallest peak in the Wasatch Front (and Utah County). 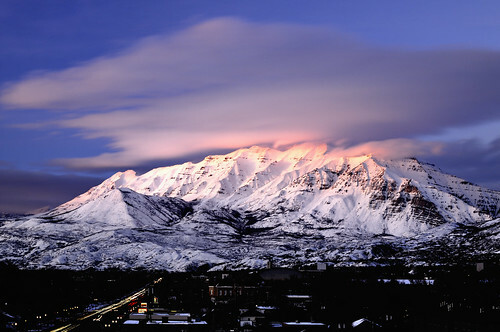 Since Nebo is about as far south of me as Timpanogos is north, I guess it’s next on my list. Just need to get rid of this limp first. The Home and Pro versions of Mozy for Mac 1.4 are out. We’ve been working on this since January, and it feels great to finally get it out the door. The major change in this release is the new file scanner. We’ve greatly improved how Mozy looks for and keeps track of files that need to be backed up. The release has been enabled this afternoon for new customers and existing customers which manually upgrade using the links above. Auto-update will be turned on for all existing Home and Pro customers shortly. Since we don’t have an official place for showing our Home users a list of what’s changed, I’m including the full list here. UPDATE: We’ve got an official announcement on Mozy’s blog. I updated the links to point to the 1.4.3 release, which has fixes for OS X 10.4 and Time Capsule. Mozy is offering 10% off new annual and bi-annual subscriptions for MozyHome Unlimited and MozyPro this month. Just type JULY into the referral box when you sign up. If you’re interested in Mozy’s free 2GB of online backup, just sign up for a MozyHome Free account. I’d recommend using someone’s referral code as you’ll both get an extra 256MB of space. If you can’t find a referral code online, you can use mine which is 56EEVL. But Mozy employees get free accounts so try to hook someone else up if possible. And if you’re a Mac user interested in helping us beta test the Mozy for Mac 1.4 release, please drop me a line at dan at mozy dot com. Mozy is offering 10% off new annual and bi-annual subscriptions for MozyHome Unlimited and MozyPro this month. Just type FEBRUARY into the referral box when you sign up. And Mozy is hiring again too. In addition to the jobs listed, my team is interviewing Windows and Mac developers. Please feel free to ask questions or send a resume to danr@decho.com. We’ll need you to be located in Utah, so apologies up front to all the awesome developers we’re going to miss out on. It’s been a long road, but the Mac version of Mozy is finally out of beta. We released our official 1.0 version late last week, and I am a happy developer. It was almost exactly a year ago that Mozy released it’s first Mac software, which is way too long to be in a beta program. We won’t let that happen again. We are going to release a business version, MozyPro for Mac, later this summer. And we have a lot of performance improvements and interface changes we want to make. There is a lot of work ahead of us, which is great. So while I was taking some deep breaths, I got a chance to read up on some of what people are saying about Mozy. iDrive, one of our competitors, just released a beta version of their Mac software, so I thought I’d take a look. The concept of ‘Unlimited Storage’ is subject to fair usage of the service. This is to facilitate a low one-price plan to backup a PC’s critical data that meets requirement for high majority of consumers; there may be some limits based on what constitutes fair usage. The current limits include 150GB of total storage and 100GB of bandwidth utilization per day. Do refer to Conditions of Use. Pricing structure for business use varies from personal use. So you get “unlimited” storage for whatever they decide is “fair.” Not really unlimited. I really like that Mozy’s unlimited service has no restrictions on space. MozyHome does have a bandwidth cap to limit how fast files are uploaded, but in practice very few people have upload speeds that reach this limit. We are always open to customer feedback, however, and reevaluate this decision from time to time. MozyPro does not have this limitation. In addition to the whole unlimited thing, iDrive’s comparison with Mozy is incorrect in several places. Still, they have some good ideas in the design of their software. And it’s good for Mozy to have competition. Keeps us all working hard at listening to our customers. My job involves working on the Mac version of Mozy. It’s good to see very positive reviews of our work. I know there’s room for improvement too, but it’s great to see happy users.